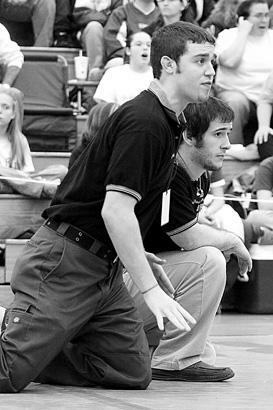 Former Mat Hawks Cody Gibbons and Daniel Parker, coaches at Moore Middle School in Louisville, encouraged one of their wrestlers at the middle school state wrestling tournament last week. Three of the Moore wrestlers medalled. Cody and I moved to Louisville about a year ago. We were invited to work with the Moore Middle School wrestlers, and since the school was near where we lived, we decided to try it. I now know and understand some of the things a coach goes through – not only with his team, but with every individual on the team. Starting the season with mainly first and second year middle school wrestlers, and without a full roster, we were still optimistic with how the season would go. Cody and I have been labeled “traitors” by some of the LaRue County demographic, but that isn’t how we look at it. Wrestling is a growing sport in this state. What better way to make it grow than to take what has been planted in you and branch out. In other words, take what you know and go out and teach it. I’ve never had a taste for something like I do for wrestling. In my mind, it is truly the greatest sport. Though Cody and I have moved beyond our LaRue County legacy, we have not forgotten – nor will we forget – our roots. I would like to personally thank Gary Canter, head coach of the Hawks, for all he taught me. Because of those things, I have been a better coach. Through all the wins, losses, and hard practices, I was able to cope and become a better person. It’s hard to get more of a high when you have a room full of young men striving to be better, wanting to win and showing up to be more than just another person on the wrestling team. We’ve also brought another part of LaRue County with us – “the vein.” Coach Canter had a vein that would pop out on his forehead during “intense” practices. Cody and I have developed this feature in our foreheads and necks. Maybe someone in the future will discover “the vein” in their own forehead. In short, I’d like to thank everyone who has had a part, or still has a part in making this sport what it truly is…the greatest. Not only in LaRue County, but everywhere.